I just need to slipstitch this set of six place mats and then off they go in the mail! 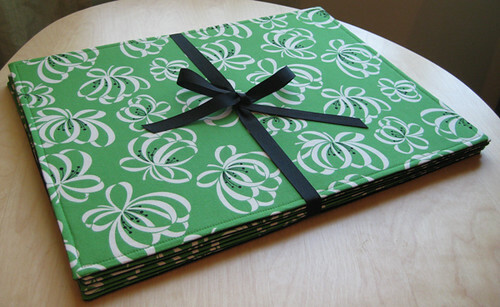 They are 18x14 with green “Katie Jump Rope” fabric by Denyse Schmidt on the front and black cotton on the back. Inside is a layer of peltex by pellon. I made these the exact same way I made Alice’s Place Mats if you would like to know additional details about construction.